Getting a Payday Loan: High Street or Online? Are you considering taking out a payday loan? When they work, payday loans can be a useful way to cover short term debts, and can range in amounts from £50 to £1000 or more, with high APR rates imposed by lenders to cover the ease by which they can be taken out. When borrowing with payday loans, you need to be aware of the risks they create over interest and missed repayments, as well as the chance of getting into debt. It’s also worth considering whether you’d be better suited to taking out a payday loan through a high street shop or via an online loan. 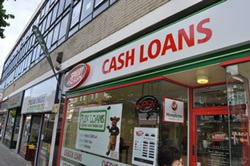 There are over 2,000 businesses offering payday loans on the British high street, with notable brand names including The Money Shop and Speedy Cash. These businesses are often placed in areas where traditional shops have had to close down, and can offer both payday loans and other services like pawnbroking, as well as the chance to sign up for longer term personal loans. One of the advantages of using high street payday loan companies is that you can get an approval through a quick meeting, where you can discuss the terms of your loan in detail with an advisor. Depending on how a payday loan is structured at a high street shop, you may also be able to take more time to decide on whether a loan is right for you than an online service. Online borrowing can sometimes lead to impulse decisions over your finances that can end up costing you more than you were expecting. By comparison, getting a payday loan online can provide you with similar interest rates and loan amounts, but with added flexibility and the chance to apply for money from home. When using services like SwiftMoney, you can also find out what the best possible loan will be for your application, with the site able to forward your application to multiple payday loan lenders. In this way, you can compare the market much more easily online than with high street companies. SwiftMoney is also worth investigating if you want to receive clear and unbiased information on payday loan terms and conditions, as well as on whether you can afford to repay the amount of APR quoted with a loan. The amount of transparency available on SwiftMoney can be strengthened here by referring to online customer charters and instructions that set out what counts as unethical borrowing, and what repayments you’d have to make on a potential loan. So, which option is best to go for if you want to take out a payday loan? In some cases, the high street can be the better choice if you’re more comfortable dealing with someone one to one when it comes to financial transactions. However, online loan comparisons can make it much easier to find out what the best possible deal is for your situation, and can allow you to more comprehensively compare the market for reputable lenders. In either case, it’s essential to look for payday loan lenders that are regulated and compliant with recommendations set out by government bodies. The Office of Fair Trading provides guidelines for how payday loan companies should operate, while Citizens’ Advice is worth consulting if you’re unsure about whether a payday loan is right for you compared to other sources of financing. Reputable payday lenders should also have a customer charter, as well as contact details for the Financial Ombudsman Service if you do want to complain about your loan. When looking at different lenders, it’s similarly worth checking whether they’re affiliated with organisations like the British Cheque and Credit Association, the Consumer Credit Trade Association, the Consumer Finance Association, and the Finance & Leasing Association.